A medium small clitocybe without any strong smell. In young scots pine on sandy heath. 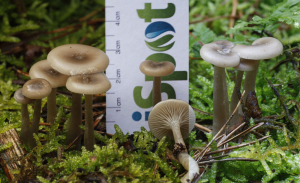 The colour of the fungus and moss on the right hand side of the image is correct but with the card in the colour ballance chosen by the camera changes and there is no automatic way of getting it correct again it seems.